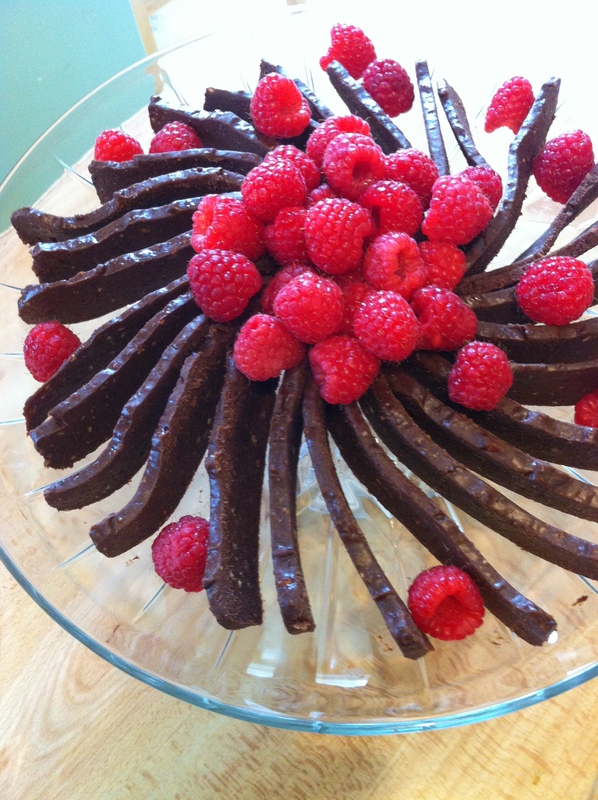 How would you react if this platter of chocolate nirvana was set before you? With a huge smile and itchy fingers?? This dessert is a flamboyant hit. Perfect for a party, which I tried it out for last Sunday. And then, Wednesday night, too. It’s a crowd pleaser for sure. The idea came to me to alter the “traditional” raw chocolate fudge recipe with dark chocolate rather than cacao powder, as many recipes I’ve seen ask for. And then, after the deliciousness had cooled, I wanted just a sliver. And the shape was perfect to create something special on the plate. The fudge is pliable from the dates, just an incredible texture, really. It’s a nice size serving when there are many dishes to sample, and lovely to have just the right amount of chocolate to melt on your tongue, not too much. Food processor extremely helpful. Plus a loaf pan and a sheet of parchment paper. Melt chocolate over very low heat in a wide saucepan. Meanwhile in wide shallow bowl steep dates in the hot rose tea, pushing them into the tea to become softened and saturated, about 5 minutes. Add dates and chocolate to bowl of food processor fitted with an S blade, add almond butter then blend, scraping down sides occasionally, and testing until the entire mix is very smooth. Pour/spoon/scrape into the parchment lined loaf pan, smoothing into corners and on the top. A little curve or unevenness will look pretty when you slice, so don’t fret about perfection 🙂 ever! Chill the fudge until solid, at least two or three hours. Lift from the loaf pan and place on counter or table. With a sharp French knife, cut into thin slices, and arrange like a flower on a pretty platter, curving the slices slightly looks very dramatic! Tumble a half pint of raspberries on top, or garnish any which way you like. Beautiful presentation of what looks like a very delicious dessert. I can’t wait to try it! Thank you Jan! 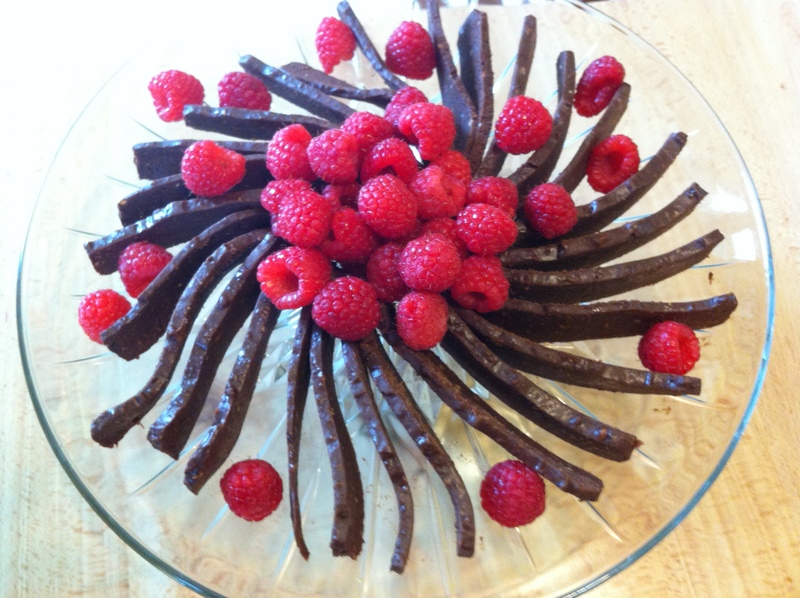 It’s hard to go wrong with chocolate and raspberries for presentation! 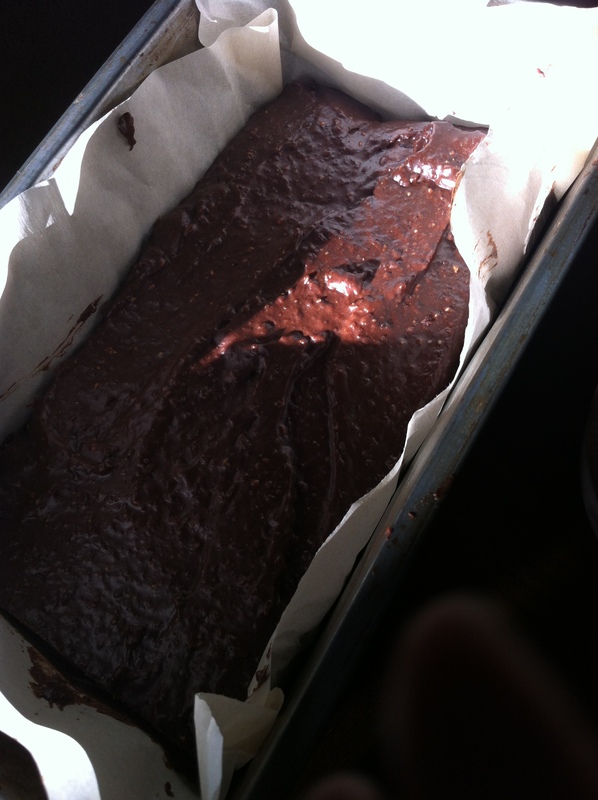 The fudge is really, really lovely – let me know how it turns out!